You know how many words a picture is worth…. Check out our video of students and tutors on YouTube. Thank you to our board member Michael P. Boyle, PhD, Associate Professor of Communications at West Chester University, for creating this for us to share the special relationships that are evident in each of these images. What do our tutors do with their students? So many potential volunteers wonder whether they could effectively help another individual, especially one struggling to learn English. But it only takes a heart and a good listening ear. Our staff supports the approximately 180 tutors who are out in the community, meeting twice per week to teach English to their student. Each month, our tutors send us an update on progress made and hours spent with their student. Reading and responding to these reports is my favorite part of my job: hearing about the hurdles cleared, advising or assisting with current obstacles and goals, and marveling at some of the stories. One tutor told about his student’s experience during his landscaping job: “Enrique said a woman came out of her house after he had edged her walk and said it looked “great.” He asked me what “great” meant. I told him “magnifico.” He was quite pleased to know that…. I made flash cards of the common flowers he will see around the homes of his clients. He is working to learn the names of those flowers.” This led to talking about the flowers in singular and plural, practicing “to be” using is and are, and putting the “s” on singular 3rd person verbs (i.e. It blooms. ), and writing a dialogue with the student, practicing typical conversations he might have at work with customers and with managers. Six brief anecdotes out of the 180 happening twice every week. Of course, our tutors volunteer because they want to make life in a new country with a new language possible for someone. Simply, they want to help. But the reports we receive show the experience is every bit as uplifting to themselves. Thank you to our dedicated tutors. Certain mundane activities in this life end up showing you what you are made of, who you can count on, and where your priorities lie. Refurbishing our office space here at the Volunteer English Program office exercised our patience, creativity, and sense-of-purpose. Today, we re-hung our iconic world map which holds a pin on each country represented by one of our students. It feels like home again. Only better. Thank you to those who may have been inconvenienced by the 2-day office closure while we got new paint and carpet! For our little 3-person staff, this turned out to be MUCH more than a 2-day experience. There are many people to thank, as we will acknowledge below. This process was as valuable as a team-work retreat. Weeks before the “simple paint and carpet job”, we began reassessing our space. What was working for us, functionally? Did it match our welcoming spirit? Everything had to be packed into boxes so the workers could move furniture. As we began clearing out and cleaning, we had an amazing opportunity essentially to hold the history of VEP in our hands: records and photos of 100’s of students and tutors who have worked together over the decades; photographs and news articles which testify to past successes and joys; the vast amounts of materials we make available to student/tutor pairs… it was inspiring. To be sure, a lot had to be thrown out and recycled. Just like at home, stuff accumulates. Too bad eBay doesn’t have a market for audio cassette and tape decks and VHS films! Letting go of dull, out-dated items is liberating. We had a museum here that outlined the history of ESL instruction and methodology. But in the process of shedding the old, we resurrected useful teaching materials. We rediscovered some good books and pamphlets that had been buried. We found notes and files of previous staff, which re-inspired us. The foundations of VEP and the energy and passion that has defined this organization were evident in each file, each drawer, each bookshelf, and we strengthened our respect for the past. The next lesson in this whole process was the “it takes a village” principle. Volunteers stepped up to help us complete the herculean task of packing, lugging heavy boxes downstairs or to the dumpsters, and then moving everything back in again. Thank you to High Associates and Dave Engle for coordinating painting, carpeting, and facilitating the move; Jim Potrako for packing and lugging; Ermias Tsegaye for move-in help; Liza Morgioni for packing, sorting, and reorganizing; decor and color consultants Toni McCauley and Barb Pfister, pro bono; our neighbors for enduring noise and paint smells; Steve Goodman and Everett Warren for technology preservation and rewiring; and most of all, our board members, students and tutors for having patience. 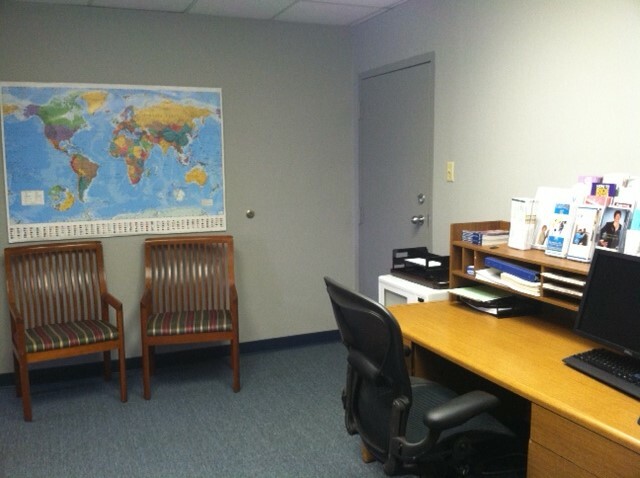 Our offices look fresh and new again. We have retained much of the decor and furniture, and replenished with more pieces donated by IBM. Now we are raring to focus back 100% on our work! Rejuvenated and inspired by our lean and mean office space, we hope that re-energized spirit, combined with a respect for our past, will benefit our students and the entire VEP family.